If you don’t already have it, download and install the Walmart mobile app at the iTunes store or Google Play store. After you have the Walmart app installed, tap Walmart Pay on the home screen. Sign in or create a Walmart.com account. You will be prompted to add a card or simply select a card currently linked to your Walmart.com account. You can also link a new card by entering the card details. — Walmart Pay can be linked to any major credit or debit card as well as Walmart Gift Cards, eGift Cards and prepaid cards. To take advantage of this promo, however, you must link and use an American Express card. After adding a card, you will be prompted to create a passcode. Use your American Express Card to make an in-store purchase of $100+ through Walmart Pay at any US Walmart store by December 31, 2016. A $20 Walmart eGift card will be loaded into your Walmart Pay account by Walmart after you complete your qualifying purchase. Walmart Pay is a feature in the Walmart mobile app that allows you to use your smartphone to pay for in-store purchases. It was designed to speed your shopping process while keeping your financial information secure. To checkout at the store with Walmart Pay, you click on the Walmart Pay button in the Walmart app, enter your PIN or use Touch ID, then hold your phone over the QR code to scan. You’ll hear a sound, along with receiving a text, when the transaction is complete. 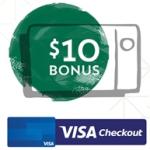 For more information on Walmart Pay and this promotion, see www.20egiftcard.com.